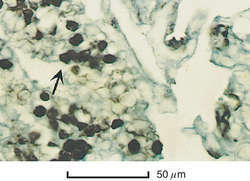 a form of pneumonia caused by a gram-negative bacillus identified as Legionella pneumophila. It was discovered after an outbreak of the disease among veterans attending a 1976 convention of the American Legion. See also Legionella pneumophila, Legionnaires' disease. Though bacterial pneumonia remains more common in this population of patients, Legionella pneumonia carries with it a severe course and a poor outcome. Legionella Pneumonia and HIV: Case reports and Review of Literature. 4) The majority of the disease causing subtypes produce an acute necrotizing pneumonia and, as a group, these infections are properly referred to as the Legionella pneumonias or legionellosis. Fatal hospital-acquired Legionella pneumonia in a neonate. Delay in appropriate therapy for Legionella pneumonia is associated with increased mortality. Legionella pneumonia in a newborn after water birth: a new mode of transmission. A Binax Now urinary antigen test with positive results can provide a diagnosis of Legionella pneumonia within 1 hour. Studies comparing the clinical manifestations of Legionella pneumonia to other types of pneumonia have indicated that Legionnaires' disease is not "atypical" and that individual clinical features such as diarrhea, confusion, hyponatremia, and chest x-ray findings are not sufficiently distinctive to distinguish Legionnaires' disease from other types of community-acquired pneumonia (18,24-26). Despite these limitations, this outbreak of Legionella pneumonia is certainly the largest to be associated with a contaminated whirlpool spa. In conclusion, this large, severe outbreak in the Netherlands shows that diagnosis of Legionella pneumonia should lead to prompt investigation of the source of infection.